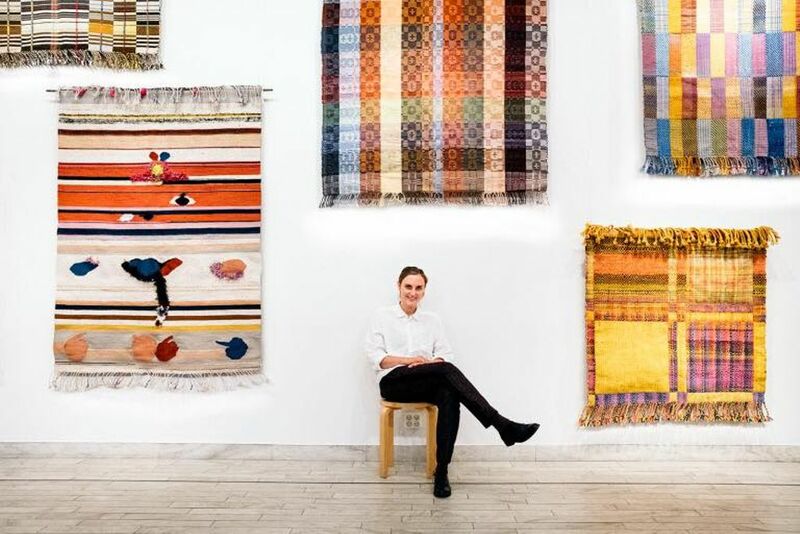 We met the craft star Josefin Gäfvert, fresh from an exhibition at Olseröd Konsthall at the heart of Österlen in Sweden. Josefin, thanks for taking the time to meet with us. Tell me, where did the journey begin, what paved your way in becoming an artist? When I was 14, there was a trauma in my family and I needed to express myself without talking to anybody. In the basement of my parents’ home there was a room with a mirrored wall where I used to spend most of my time sewing and painting self-portraits. I wanted to become a fashion designer in my early life because I used to think you need to be a genius if you want to become an artist. I created a lot of everyday use objects, like cushions, towels, and rugs, but they were never really optimized for being used. I guess, functionality is never being my highest priority. It is just recently I have realized that what I do is art. What is the biggest challenge at this early stage of your career? Money and time are my biggest challenges. I have a nine months old baby, so I need to maintain balance between my work and time. Professionally as an artist, do you have any goals that like to accomplish? The most important thing is to have time to develop and continuing the work in a way that´s intriguing for me. I would like to do something on a bigger scale, like a public work, that I could work on for a longer period and that would be seen by many people. 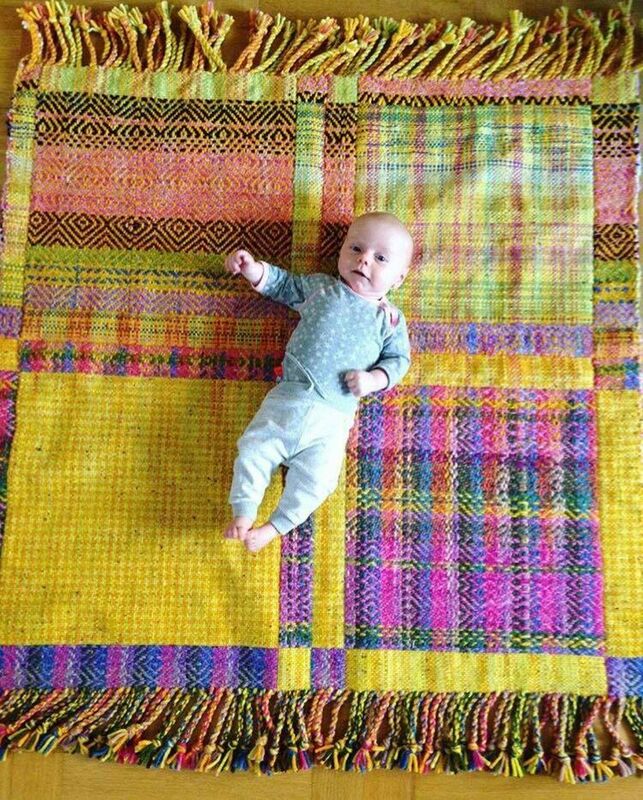 How did you start the working with textile and weaving? I started sewing clothes because I wanted to look cool and elegant. Coming from Gotland, it it wasn't too hard (hehe). Initially, I wasn't at all interested in handicraft, but I accidentally took a course in screen printing which later on led me towards Nyckelviksskolan where I first learned to weave. I like risk-taking within the boundaries of the loom. You've just finished a joint-exhibition with Åsa Jungelius at Axel and Anette Mörner's beautiful place, Olseröd Konsthall. Did you two meet for the first time connected to the exhibition? Yes, Åsa and I met through the exhibition, we had never met before, and I like to believe that our art was meant to be together, a good match. We love the way you work with colours, it makes us happy. Can why tell us if it's on purpose or just happen by chance? To me, colours evoke feelings, and it inspires me. I love to see how colours are coming together in an unpredictable way. What does art mean to you as part of your home? I'm more interested in the creation of art, as opposted to the decorasional side of it. I let my boyfriend decide how to decorate our home. At home, do you have any works by yourself or by other artists? I have some of my own work on the walls (and floor). I'm comfortable living with them. I would love to have an apartment filled with great art, but it's not so important to me. A favorite artist hanging on your walls? Anyone outside the industry that has left a particularly strong impression on you? Olle Ljungström. I got his first CD: "En apa som liknar dig" when I was just fifteen, its music and lyrics has been inspired me a lot. While I am weaving I listen to books, radio, and podcast. My favorite hobby is to listen to writers talks about their writing, for example in the” Hysteria” podcast. I've just finished the exhibition Tête-à-Tête at Olseröds Konsthall, and we'll see what that leads on to. If I am allowed to fantysise, it would be incredible to do a collaboration with the pioneering American fiber artist Sheila Hicks. She seems to be a very brave and intelligent woman. It would be fun to have some commercial collaborations too, for example, with Kasthall. Thruth being though, this summer, I will teach a weaving course at Sätergläntan and also run my own summer shop / gallery on Gotland, Fide Ateljé, together with my sister who is a ceramicist. Check out Josefin's work here. Raised on the tiny French island Ile de Ré, Marine Tanguy grew up far from the art scene. Despite, she managed to spearhead her first gallery at the age of 21, and then 2 years later, age 23, set up her own art gallery in Los Angeles. We stop by for a moment, in her new hometown, to see what she is up these days.